Do tell. What exactly is a Mommy-boat skipper? Normally I would say an 02 Tahoe is borderline and 'it depends.'. In most other cases(*) I would say that if the vehicle is black or dark blue and has a prominently displayed US Sailing sticker and maybe even a front license plate comprised of a yacht club pennant where the club's exclusivity is so legendary that no name is necessary, every lesser local citizen knows the pennant's social implications, then 'yes'. For those with vehicles that fit that description there is one path to redemption, thankfully, and that is to always be carrying a Sunfish hull around on the roof. By definition, on these vehicles a Sunfish will fit entirely over the cab roof and not even overhang the front windshield or back tailgat at all, and having it there won't have any impact whatsoever on aerodynamics. Unless the hull is actually in the water, however, it would always have to remain on the vehicle. (*) In your own case, if your SUV is sporting the MY2FISH license plate (and considering the blog that this represents), it really does drift more toward the 'icon' status described in the earlier post, or 'future icon' if you are sensitive about such things. That status comes with particular priviledges, by the way. Not the least is that Sunfish etiquette is that every other Sunfish sailor should buy the first drink (large enough groups of them mean that you never should buy). As also previously noted, the Texas equivalent is the oversized Sunfish tattoo and for Texas and Gulf sailors the no-pay policy extends to the tattood gent's esteemed missus (I realize that I am being presumptuous in assuming she also doesn't have one of her own that we just don't know about). Just to be safe however, since the MY2FISH license plate might get visually lost on a vehicle that size, I would take the extra precaution of prominently displaying a large multi-colored my2fish Sunfish-shaped logononneach of the rear side windows. Adding those I think should do the trick. I'll be "car-topping" a Sunfish in April, but that's not for everybody...With a small boat, you don't need much car. I believe there is a Sunfish sailor that regularly tows with his bicycle. Flat land Florida but it works for him. This is one of the classic threads on this forum. Glad it lives on. Wonder what Gunnar bought for hauling his Sunfish? 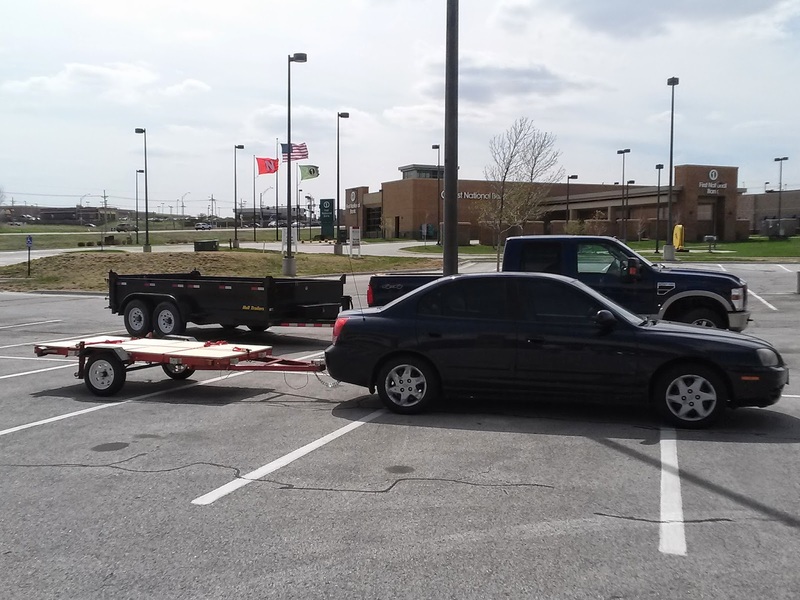 "...We bought our hitch online for our 2004 Elantra (128 ponies)..."
You don't need 128 ponies to tow your Sunfish! You could tow a Sunfish with a Smart Car! And, there's a guy on this site that tows his with a bicycle. I thought of this thread when reading of inspection ports. "Classic" also describes my car collection. (1960 Morris Minor, 1968 BMW 1600, plus the 1971 VW camper used for flat-towing). Back in the 1980s, I installed an inspection port in my VW camper. This allowed me to carry long 2x4s—plus my miniature dachshunds could get a look outside. (The interior panel was cut to the size of their collars).